Assurance of Consequence | Mushan, Etc. It was a trinket called Assurance of Consequence. This trinket drops from the Sha of Pride, the final boss in the first wing of Siege of Orgrimmar. Which means it also drops in the first wing of flex, which is named Vale of Eternal Sorrows. This is also the name of the first wing of Siege of Orgrimmar, LFR edition. Black Arrow, Camouflage, Disengage, Feign Death, Rapid Fire, Stampede. It’s a pretty good list, although for PvE, Camouflage does very little for me. But the 35%-plus cooldown reduction of the other abilities with any and every version of this trinket (the reduction improves as the trinket’s ilevel goes up) makes it very tasty. When I found out about these trinkets, I knew that I wanted to write this post… but I wanted confirmation on something first, so I put it on the back burner. That confirmation came this week. The Siege of Orgrimmar raid release schedule was announced. The Normal, LFR, and Heroic mode release schedule is exactly the same as it was in 5.2. Click the link if you haven’t seen it yet. My best hope, or dream-scenario, is that the flex version of this trinket will drop for me next week, and I will never have to set foot in LFR in hopes of getting it. My reasonable hope is that it drops for me over the next few weeks in flex or LFR. My reality is that I will probably be grinding out LFR and flex for the next ten weeks, praying for a drop that never comes like I did with the T14 shoulder token from Lei Shi. I fought her to the bitter end on Mushan, and never saw it. I hope it doesn’t come to that with this thing. Unfortunately, the more things change, the more they stay the same. 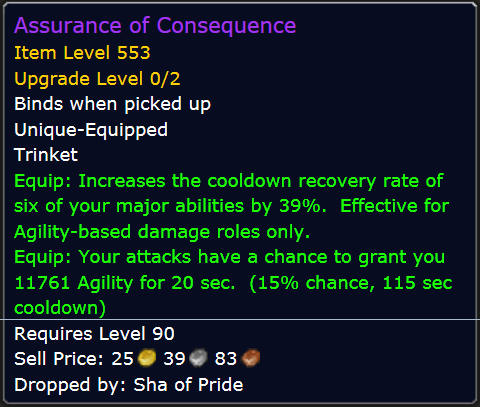 This trinket looks so good that it seems like a must-have for the performance improvement it potentially affords. As such, until I have one in my grimy clutches, I will be farming the crap out of it. I didn’t want it to be this way. I wanted to avoid LFR totally on my hunter this tier, and had already made the decision not to chase tier tokens in SoO LFR. But since Blizzard made no alterations to the release schedule, and that trinket becomes a potential LFR drop only a week after the patch starts, I will at least be running LFR for that one. It’s a no-brainer. But I feel a responsibility to making my team the best that it can be. And if being able to move better and do more damage faster – sooner – means I slog it in LFR against my desires, than so be it. I consider myself a leader on my team, at least on the offensive side of the ball, and as a leader, I try to be my best. And this trinket has both DPS and tactical implications that I want to be able to take advantage of as soon as possible: more Rapid Fires and Black Arrows and Stampedes mean more DPS, more Disengages mean possibly more self-healing and better movement options, more FDs mean better survival. So bringing that better Mushan to the table – to the team – is important to me. Now, if Blizzard had decided to either hold back the release of LFR or not put potentially game-changing items in LFR, then of course I wouldn’t worry about it. But if a piece of gear can help my team, I’m generally going to chase after it every time. I would have a hard time foregoing the opportunity when it’s there. It feels different going into a 10-man team with a goal of progressing without doing your homework than it does knowing you did everything you could to prepare, in my experience. I wish the game was a little different. But I understand the reasoning behind / arguments for why it is the way it is. In reality, I have nothing major to complain about. While I personally would prefer that LFR be moot for my main toon for an entire tier, it’s exciting that there will be things to do again, and fun new gear to acquire. I do enjoy playing my hunter over any other toon, after all! Ignores all the internal/external struggle and bursts out: Oh my that is one tasty trinket! I haven’t been checking details for the patch yet, but oh boy oh boy oh boy.